Oh, 191st most acclaimed album of all time, you let me violate you, you let me desecrate you, you let me penetrate you, you let me complicate you. A 1994 industrial bellwether is this week's Counterbalance. Mendelsohn: If there was one album that could concisely sum up my musical taste as a teenager, it would be Nine Inch Nail’s The Downward Spiral. In 1994, I was wandering around the rock and roll wilderness, trying to find my way with nothing more than a couple of Rush records and a mixtape of Pink Floyd’s greatest hits. Then the video for “Closer” hit MTV and my world changed. A path opened up in the woods and I was shown the way into my rock and roll. I spent the next couple of years listening to The Downward Spiral record, along with the rest of the NIN archive, plus a myriad of less talented bands who were proffering the industrial rock that was fighting for ears in the mid ‘90s. None of it was as well thought out as Trent Reznor’s vision. Some of it was downright terrible (obligatory finger pointing at Marilyn Manson -- not the worst, but a frequent and repeat offender). By the end of high school I had cut my long hair, boxed up the black t-shirts and acquired a marginally better taste in music. I would check in with Nine Inch Nails from time to time over the last decade but it seemed that aside from the ardent following Reznor had built for himself, there was little cultural currency left in the newer albums, as he drifted into an atmospheric approach that lent itself better to movie scores than rock albums. Returning to this album after nearly 15 years, I’m surprised by how well it has held up in my mind. And after spending so much time parsing the Canon, I am no longer suspicious of this record’s ranking at No. 191 on the Great List. The Downward Spiral is still the album that changed the world for me but I am thrilled to be viewing it within the context of the Canon. I never really understood the critical appeal until now. I know the 1990s aren’t your thing, Klinger. It has been well documented that you hold little, if any, affinity for the last decade of the last century. But here we are and it is time for your opinion. Were you able to see beyond the industrial spurts of noise, the incomprehensible blasts of guitar and the cringe-worthy lyrics? Mendelsohn: Pretty Hate Machine? Yes. The Fragile? No. Mendelsohn: I was the angst-ridden teenager in 1994. The anger and alienation that drove The Downward Spiral spoke to me on a level like no other music. In retrospect, there is no way I could fully understand the thematic material that formed the basis of Reznor’s musical neurosis. But the sheer sonic push of the record speaks a universal language and as soon as the gunshots in the beginning of “Mr. Self Destruct” morphed into that unstoppable beat, I was hooked. I’m not nearly as captivated as I once was. The unmitigated anger and depression no longer speaks to me and I find it a bit off putting having to listen to a man battle his demons for an hour before pulling the trigger. Despite all of that, I’m still amazed at the sonic landscapes that Reznor paints throughout the album. They are intricate and complex, a layered aural visage that loops around itself, repeating phrases and hooks as it ebbs and flows from a torrential flood to a quiet trickle. On top of all of that, we get to see Reznor as a master synthesizer, marrying synth pop, the rhythmic nature of Joy Division with nods to hip-hop, and classic rock in a complex package that expertly used the quiet/loud dichotomy of grunge music but eschewed the stripped down aesthetics for something much more complicated. Listen to “Ruiner". Reznor packs all of that into five minutes of agro-rock. I realize I’m at a bit of an advantage having completely internalized this album twenty years ago. What I can only imagine sounds like an incomprehensible wall of noise to you seems like a walk in the park to me. Still, is there anything on this record that caught your attention? Do you see a reason for this record to be hanging around the top 200? Klinger: Sure, there are a number of little sonic doodads throughout the record that catch my ear, mostly when the more organic bits poke their head up through the electrosonic permafrost. And I think I can see why Reznor is now an Academy Award-winning score composer. His ear for detail makes him eminently suitable to creating a mood. Like you said, he's combining a number of different textures into the tracks here, and that brings about moments that are very appealing. That's not quite the same thing as being a great songwriter, though, and that's where I must part company with this album. Is there a reason for The Downward Spiral to be hanging around in the Top 200? I don't see why not. It's an album that has clearly meant a lot to a number of people, even if they don't return to it all that often. And I know I shouldn't discount people's relationships their formative records (even though I'm pretty sure I do it all the time). I know The Downward Spiral is doing a good job of tapping into something very powerful for people, and I recognize that it’s there even if I can't hear it myself. Mendelsohn: That is incredibly diplomatic of you. Although I still think Reznor was one of the better songwriters of the 1990s (not exactly a hard feat to achieve, but still). It’s clear that Reznor is no Bob Dylan. Being a good songwriter means being in control of your faculties enough to think about both the music and the words -- and lyrics are not Reznor’s strong suit. The man used the word “pig” or “piggy” nearly 400 times over the course of an hour. I made that up. I don’t care enough to actually count. The fact is, I always got the feeling that the lyrics came second, which is why, as you noted, Reznor has had so much success scoring films. As a musician he is able to pour raw emotion into his music without filtering it. That type of energy can be hard to listen to up close, especially when it comes from such a dark place. Nine Inch Nail’s music may be slightly unconventional, abrasive or obtuse, but strip away the layers and under almost every track on The Downward Spiral is a pop song with an undeniable groove or a beautiful melody so stunningly stark that its hard to believe they all start in the same place. Reznor did manage to write one truly magnificent song and he did it without the drum machine, synthesizer or industrial noises. At the end of an hour of angry ranting, the acoustic “Hurt” stands in sharp contrast to the agro-rock that fills most of the record. This is the song, Klinger, that ultimately makes this record work, not only for its beauty, but for the needed resolution to sixty minutes of full-throttle rage and providing the slightest sliver of hope before the album fades into feedback and white noise. In the more experienced hands of Johnny Cash, “Hurt” was taken to an entirely different level and exposed to an audience to otherwise would not have heard any of Reznor’s music. The resurrection of “Hurt", nearly a decade after its original release is really a testament to not only Cash’s ability to hear the music through the song, but Reznor’s skills as a songwriter. 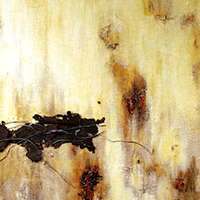 The Downward Spiral is far from being a perfect album, but it will remain a set piece within the Canon due to Reznor’s unique vision for rock and roll. I’m not looking forward to the inevitable industrial rock revival scheduled for sometime in the next ten years, but if Reznor is still willing to lead the charge, it might not be so bad.